functions of the plastoglobule in plastid metabolism, stress perception and tolerance. ​This will lead to important knowledge to be harnessed for improving the productivity and nutritional quality of crops through enhanced stress tolerance, photosynthetic performance, nutritive value, and by the application of metabolic channeling for production of high value compounds and biofuels. In higher plant chloroplast, the plastoglobule is formed from, and remains attached to, the thylakoid membrane. Despite this persistent physical connectivity, both compartments maintain a distinct set of proteins and metabolites. How is the distinct composition maintained? How are proteins selectively targeted to the plastoglobule? Is there controlled exchange between the compartments? If so, how does such exchange impact plastid metabolism and photosynthesis? The size and/or abundance of the plastoglobule is highly responsive to changes in environmental conditions (such as biotic and abiotic stresses), and developmental transitions (such as senescing gerontoplasts or nascent chloroplasts with under-developed thylakoids). At basal state (i.e. pampered, consistent, growth chamber conditions), plastoglobules are typically around 25-75 nm in diameter. But, when the plant's growth environment is perturbed, plastoglobule diameters can increase more than 10-fold, to 600+ nm, as well as revert back upon removal of the perturbation. Staining patterns in transmission electron micrographs also vary from solid black, as seen to the right, to light gray interiors with a sold black periphery (e.g. Singh, et al. 2010 Plant Phys), indicating alternative molecular compositions. It remains to be seen what drives these dynamic responses at the mechanistic level. One example of the dynamics of PG morphology. Swelling of PGs in response to a moderate light stress treatment is shown. Wild-type A. thaliana was grown at 120 uE and shifted to 520 uE for 3 days. Similar phenomenon are seen in response to a diverse array of biotic and abiotic treatments. Changes in the plastoglobule can be manifested as increased size or abundance or staining patterns, and depends on the species and treatment. The plastoglobule can be seen as a microdomain within the thylakoid membrane, serving as a dynamic platform for recruitment of specific proteins and metabolites for efficient metabolism and signaling processes. As the requirements of the plant change, the composition is modified appropriately. Evidence supporting this view has been reported; the 3 plastid-localized enzymes of jasmonic acid biosynthesis have been found to be selectively recruited to the plastoglobule during light stress in an abc1k1/abc1k3 double mutant, but not in the wild-type. 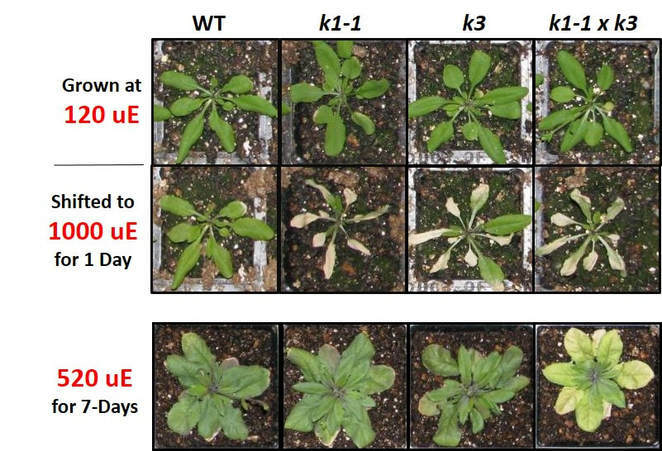 This double mutant responds to the light stress treatment with a genetically-controlled degreening process (see next section below - A Mediator of Plant Stress Response). It is believed that the dismantling of the thylakoid releases fatty acids that are transferred to the plastoglobule and serve as substrate for the jasmonic acid biosynthetic pathway. This same study also found evidence that Pheophytin:pheophorbide hydrolase (PPH) - one of the initial steps in chlorophyll catabolism - is drawn to the plastoglobule under these conditions. This is logical, as the immediate downstream step in chlorophyll degradation (Phytol esterase; PES) is also known to be localized at the plastoglobule. In addition to the highly responsive plastoglobule morphology, mutant analyses of plastoglobule-localized gene products also demonstrate the strong relationship between proper plastoglobule function and plant stress tolerance. Arabidopsis thaliana knock-out mutants of two plastoglobule-localized kinases (ABC1K1 & ABC1K3) show a conditional light stress phenotype. Under optimal growth chamber conditions, these mutants grow and develop as the wild-type, but show extreme sensitivity to various abiotic stress regimes (including light stress, nitrogen deprivation and drought), which leads to rapid chlorosis or degreening. ​Analyses of loss of function mutants in another plastoglobule-localized protein, FIB4/FBN4, showed heightened sensitivity to bacterial pathogens in Malus domestica (apple) and A. thaliana. fib4 RNAi knock-down line in apple and a T-DNA insertion line in A. thaliana, are both more sensitive to light and oxidative stress as well. Through determination of the plastoglobule proteome, development of a co-expression network and detailed characterization of plastoglobule-protein mutants, a testable model for plastoglobule function has been put forth, incorporating the two broad roles for the plastoglobule outlined below. Plastoglobule function is tightly linked to thylakoid remodeling processes. This is reflected in the highly dynamic, reversible morphology of the plastoglobule. Plastoglobules are found to swell in size or increase in number, in response to most stresses (both biotic and abiotic). A strong functional link to the thylakoid is logical in light of the physical continuity of plastoglobule and thylakoid, enabling the exchange of metabolites and proteins. 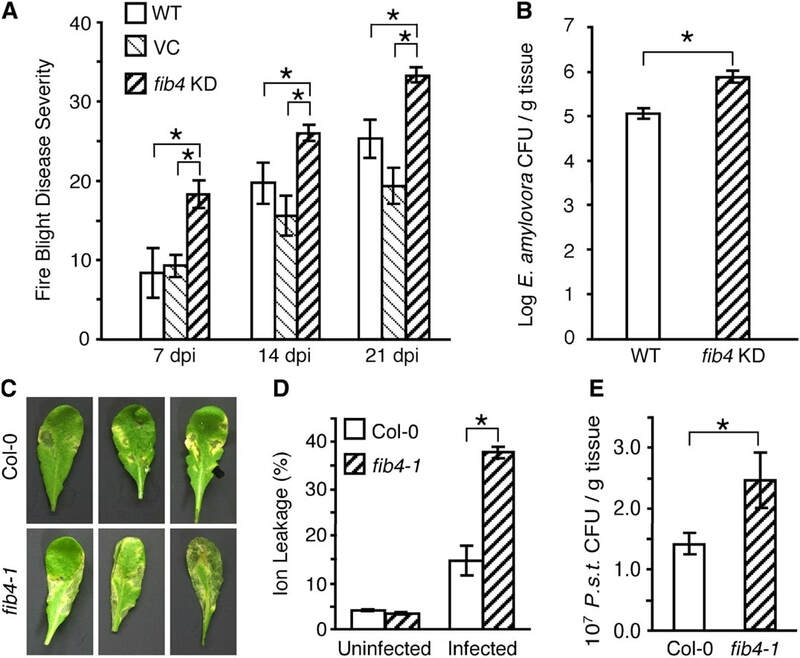 Consistent with the relevance to stress adaptation, Arabidopsis thaliana mutants impaired in the plastoglobule-localized ABC1K1 and/or ABC1K3 kinases show heightened sensitivity to a number of abiotic stresses, leading to alterations in lipid metabolism and recruitment of the jasmonic acid biosynthetic pathway to the plastoglobule. Understanding the relationship between plastoglobules and thylakoid remodeling will present significant opportunities for crop improvement under adverse environmental conditions. Metabolism of prenyl-lipid compounds, such as carotenoids, tocopherols, and phylloquinone is a central aspect of the current plastoglobule model. These compounds are crucial to the photosynthetic performance of the plant, e.g. through light harvesting or photoprotection, and are directly relevant to human health. Plastoglobules are rich in prenyl-lipid compounds, including tocopherol, quinone, and carotenoid species, and host a number of enzymes in the metabolism of these compounds. Also localized to plastoglobules are several ABC1K kinases which evidence has implicated in regulation of prenyl-lipid metabolism. Work on ABC1K1 and ABC1K3 has supported this hypothesis, and identified several candidate targets of phosphorylation. Yet it remains unclear how the various metabolic processes of the plastoglobule are controlled and coordinated to enhance stress adaptation. This is a question of great importance as society seeks to expand crop yields and enhance nutritional quality in the face of climate change. How is the morphology of the plastoglobule controlled? The dynamic shrinking and swelling of the plastoglobule has been clearly documented in many plant species, but even the most fundamental questions regarding the mechanism of its formation from the thylakoid, and the regulation of its dramatic changes in size remain unaddressed. What induces the blebbing of the outer thylakoid membrane leaflet? What promotes and maintains the extremely tight curvature of the plastoglobules? The answers to these questions will have important ramifications not only for our understanding of plastoglobule formation but also fundamental knowledge of membrane biophysics and biochemistry that can extend throughout all domains of life. What protein complexes are present at the plastoglobule and how are they regulated? Research has demonstrated that specific proteins within common metabolic or signaling pathways are recruited to the plastoglobule for interaction in metabolons (i.e. metabolic channeling). Moreover, recently published BN-PAGE-MS/MS analyses have further supported the presence of specific protein-protein complexes at the plastoglobule and generated hypothesized interactions for testing. The Lundquist Lab is testing for these specific interactions and investigating their dynamic nature. We are addressing this using several parallel approaches, including: i) chemical cross-linking and mass spectrometry, ii) co-IP/pull-down experiments, and iii) yeast 2-hybrid screens. Ultimately we seek to define the complete, dynamic plastoglobule “interactome”. How are proteins selectively and dynamically recruited to the plastoglobule? The core proteome of the plastoglobule consists of about 30 proteins that are highly enriched or exclusively found in this compartment, as well as a number of additional proteins recruited under specific conditions. The determinant(s) of this plastoglobule targeting are largely unknown but are of great interest for fundamental and applied research applications. To explore the mechanism(s) of protein recruitment to the plastoglobule we are identifying protein domains critical to protein.